A furnace system designed by Jefferson Lab Staff Scientist Grigory Eremeev and his colleagues adds tin to the inside surface of niobium cavities. A niobium test cavity and tin are placed inside and heated up to 1200 degrees Celsius. At that temperature, the tin is vaporized by the heat. The tin vapor bonds to the inner surface of the niobium cavity, producing a layer of niobium-tin that is just a few thousandths of a millimeter thick. Grigory Eremeev wants to double the efficiency of some of the most efficient particle accelerators being used for research. Now, the staff scientist at the Department of Energy’s Thomas Jefferson National Accelerator Facility has just been awarded a five-year grant through DOE’s Early Career Research Program to do just that. Managed by the DOE’s Office of Science, the program provides support to exceptional researchers during the crucial early career years, when many scientists do their most formative work. Eremeev is one of 49 awardees this year, which includes 22 from the National Labs and 27 from universities. His award includes $500K per year for five years. Eremeev works with accelerator components made of a metal called niobium. Niobium is a shiny silver metal that becomes a superconductor when chilled to just a few degrees above absolute zero. For use in an accelerator, the niobium is formed into specially shaped accelerating structures called cavities. Niobium cavities harness and impart energy onto particles, thereby “accelerating” the particles for use in nuclear physics experiments for exploring the particles inside the nucleus of the atom. Superconducting niobium cavities can store energy with almost no losses, allowing the structures to accelerate a continuous beam of particles. Jefferson Lab’s Continuous Electron Beam Accelerator Facility was the first large-scale accelerator to use this technology. Because of its efficiency, CEBAF has been used to conduct many experiments in the nucleus of the atom that weren’t thought possible before, and a recent upgrade of the machine has taken advantage of new technology advances, yielding even more efficient accelerator cavities. But Eremeev thinks that these structures can be further improved, so he and his colleagues are looking at ways to optimize the preparation of these structures to coax improved performance from them. “We are trying new techniques to reach the potential of the material. So, we are trying different parameters to get better performance,” Eremeev says. One of the most promising new parameters that Eremeev and his colleagues are testing is the addition of other superconducting metals to the surface of niobium accelerator cavities, such as tin. Like niobium, tin is a shiny metal that becomes superconducting when cooled to low temperatures. The researchers are working to mix tin with the surface layer of niobium on the inside of the cavities to produce a thin layer of niobium-tin (called Nb3Sn). It’s thought that this alloy will provide a more efficient superconducting surface than pure niobium. Eremeev and his colleagues designed and constructed a furnace system to add tin to the inside surface of niobium cavities. A niobium cavity and tin are placed inside and heated up to 1200 degrees Celsius. At that temperature, the tin is vaporized by the heat. The tin vapor bonds to the inner surface of the niobium cavity, producing a layer of niobium-tin that is just a few thousandths of a millimeter thick. Eremeev says the niobium-tin cavities have already shown great promise in initial testing. “We want to understand and push the limits of the niobum-tin, trying to approach, as close as we can, the performance limitation of the superconductor,” he says. 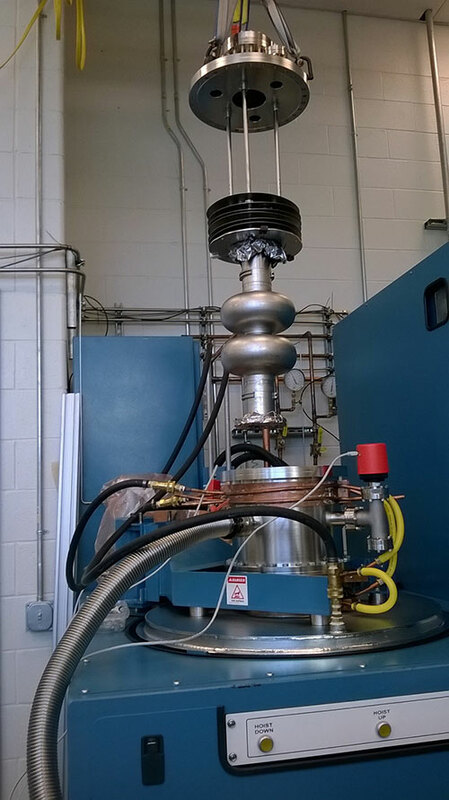 For instance, the niobium-tin cavities will stay superconducting at twice the temperatures that are needed for pure niobium accelerating cavities, which could provide significant operational cost savings for future accelerators using the technology. In the 12 GeV CEBAF, for instance, the niobium cavities must be kept near 2 Kelvin (-456 degrees Fahrenheit) when operating, which requires 10 MW of power to refrigerate. At double that temperature, 4 Kelvin, there is the potential to only require 6.5 MW of power, a significant savings. So far, tests of this new type of accelerator cavity have been limited to R&D units. Eremeev says the next step is to produce two full-size cavities and install them in a section of accelerator for testing under real-world operating conditions, a goal that is now made possible by the DOE Early Career Research Program grant. “We need to demonstrate it in a CEBAF five-cell cavity to show that it works,” he says. Jefferson Lab is a world-leading nuclear physics research laboratory devoted to the study of the building blocks of matter inside the atom’s nucleus – quarks and gluons – that make up 99 percent of the mass of our visible universe. Jefferson Science Associates, LLC, a joint venture of the Southeastern Universities Research Association, Inc. and PAE Applied Technologies, manages and operates the Thomas Jefferson National Accelerator Facility, or Jefferson Lab, for the U.S. Department of Energy’s Office of Science. On December 14, full-energy 12 GeV electron beam was provided for the first time, to the Experimental Hall D complex, located in the upper, left corner of this aerial photo of the Continuous Electron Beam Accelerator Facility. Hall D is the new experimental research facility – added to CEBAF as part of the 12 GeV Upgrade project. Beam was also delivered to Hall A (dome in the lower left). The newly upgraded accelerator at the U.S. Department of Energy’s Thomas Jefferson National Accelerator Facility has delivered full-energy electrons as part of commissioning activities for the ongoing 12 GeV Upgrade project. At 4:20 p.m. on Monday, Dec. 14, operators of the Continuous Electron Beam Accelerator Facility (CEBAF) delivered the first batch of 12 GeV electrons (12.065 GeV) to its newest experimental hall complex, Hall D.
The 12 GeV Upgrade project, which is scheduled to be completed in September 2017, was designed to enable the machine to provide 12 GeV electrons, which is triple its original design and double its maximum operational energy before the upgrade. By increasing the energy of the electrons, scientists are increasing the resolution of the CEBAF microscope for probing ever more deeply into the nucleus of the atom. The $338 million upgrade entails adding ten new acceleration modules and support equipment to CEBAF, as well as construction of a fourth experimental hall, upgrades to instrumentation in the existing halls, and other upgrade components. Once the upgrade is complete, CEBAF will become an unprecedented tool for the study of the basic building blocks of the visible universe. It will be able to deliver 11 GeV electrons into its original experimental areas, Halls A, B and C for experiments. The full-energy, 12 GeV electrons are now being provided to the Experimental Hall D complex to initiate studies of the force that glues matter together. In Hall D, scientists hope to produce new particles, called hybrid mesons. Hybrid mesons are made of quarks bound together by the strong force, the same building blocks of protons and neutrons, but in hybrid mesons, this force is somewhat modified. It’s hoped that observing these hybrid mesons and revealing their properties will offer a new window into the inner workings of matter.